YNAB makes it easy to know exactly what you can afford for your next payment—right in your Credit Card Payment category, as well as the top of your account register. If you're just getting started, check out Credit Cards Basics first! There's nothing you could read that would explain credit card payments better than the 100-second video below. Pull up a chair and get comfortable (but not too comfortable, it's only 100 seconds 😉). Your credit card payments are now stress free, and you're a whole lot closer to debt free! The amount you can afford is the Payment amount in the credit card's payment category—as long as you don't have red overspending in your budget. No more guessing! Go to the credit card account register. In the top right, you'll see the amount you have available for the payment. 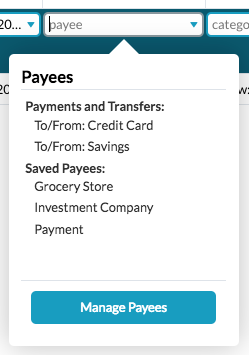 In the Payee field, choose from the Payments and Transfers list. Select the account from which you're making the payment. YNAB will remember your selection for the next time you record a payment. If you're not planning to pay the full amount you have set aside in your budget, you can edit the amount—and then Save! No category is needed, because your credit card account is already tied to your credit card payment category. For Linked Accounts, credit card payments will import once they clear. If it's the first payment between two particular accounts, YNAB won't know to make it a transfer. That is, unless you enter the payment first—using the steps above—which allows them to automatically match up. If a payment imports as regular transaction, change the payee to one of your Payments and Transfers options. Then you'll see one side of the transfer in each account. If you've already imported the payment in the other account, it should have matched up and just need approval. Going forward, as long as your bank uses the same payee for payments, YNAB will know to make it a transfer automatically. All you'll need to do is approve the match!